Tourists are still flying into Turkey despite two weeks of unrest but future bookings could suffer if anti-government protests in Istanbul continue. Violent demonstrations, tear gas, Molotov cocktails and riot police. Probably not what you look for in a holiday destination. Turkey has been rocked by two weeks of anti-government protests, but with the unrest largely limited to the cities of Istanbul and Ankara, tourists are still flying into the country and heading for the beach. However, Turkey's travel industry -- which generates much-needed foreign currency revenue -- could be in trouble if the unrest intensifies and foreign governments continue to advise tourists to avoid the protest hot spots. "People are definitely nervous," said David Segel, managing director of West End Travel in London. Turkey has become a top destination for Europeans tourists in recent years, making the most of its warm weather, beaches and rich history. The tourism industry alone brought $23 billion into the country last year. In the peak months of July and August, nearly 10 million people usually flock to the country, with roughly 40% flying into Istanbul, where the fiercest demonstrations are concentrated around one of the city's main squares. According to the MasterCard Global Destinations Cities Index, Istanbul was among the fastest growing tourism markets in the world last year, receiving 11.6 million international visitors and earning $10.6 billion in revenue. Tourists with pre-booked flights and package holidays are still flying into the country since they're unable to secure refunds for their trips, said Segel. The economic fallout from the unrest has so far been insignificant, Finance Minister Mehmet Simsek told CNN, but if protests continue the tourism industry could suffer. "We've seen in the past that events like this have had some temporary impact, but no lasting impact," Simsek said. Prospective travelers could opt for other destinations, leaving the Turkish tourism industry with hotel rooms and airline seats to fill. Travel discounts could be in store during the peak summer season. "Europe's a big place. I'd give Turkey a miss," said Segel, though he expects the country's tourism market will bounce back by next year. Airlines, hotel chains and major tour operators say it's still business as usual in Turkey, pointing out that many popular beach destinations are far from the protests. The unrest in Turkey began as a peaceful protest against government plans to demolish a park in Istanbul, but quickly turned into a full-fledged uprising when police used hostile tactics against the protesters. Disparate groups have united across the country to accuse the government of authoritarianism. 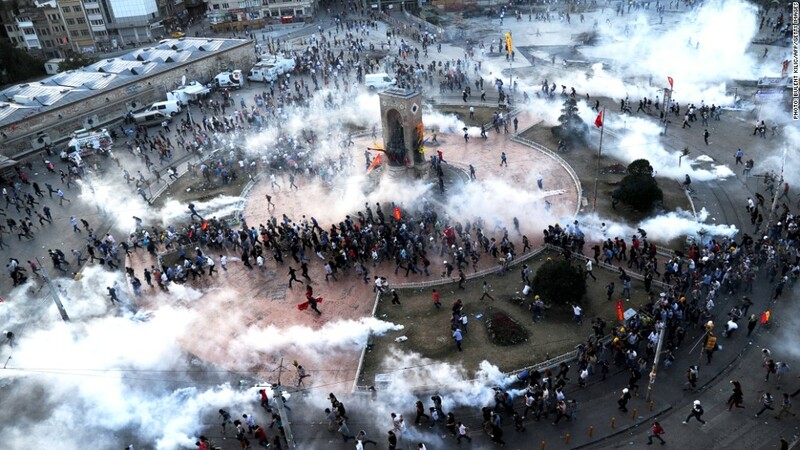 A worldwide audience watched as police fired water cannons and tear gas at defiant protesters. Turkish Prime Minister Recep Tayyip Erdogan agreed Friday to put the brakes on his park redevelopment plan in Istanbul for now, a sign of compromise from a leader who had previously insisted on going ahead with the plans. The government will wait until a court considers the protesters' objections, officials say, and a referendum will be held in Istanbul on the construction plan. Thankfully for risk-averse tourists, most of Istanbul's top attractions such as the Blue Mosque, Hagia Sophia and Topkapi Palace, are located in Sultanahmet, far from the heart of the protests in Taksim Square. "Istanbul is as appealing as ever," insists one local. "Much like a beautiful woman, but with smudged mascara." --CNN's Joe Sterling, Ben Brumfield, Gul Tuysuz and Talya Arditi contributed to this report.